Too much potatoes and stuffing? I feel you. Try these simple yoga techniques to help improve digestion. Travelling or sitting for long periods of time? Try this Crescent Lunge to release low back pain and stretch out the tight hip flexors. ​Keep front knee above front ankle. To protect knees, do not bend knee beyond the ankle. 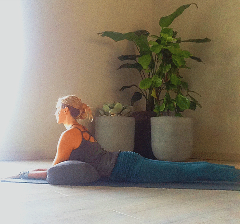 ​Spread toes wide, lift front hip points up and reach arms up for a deeper psoas stretch. Feeling full after a delicious meal? 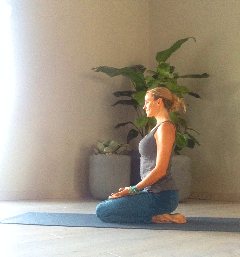 Try sitting on your knees in this pose to create space for digestion. ​If knees are tight, sit up on blocks, books, pillows, blankets. Whatever is available. ​Spread toes wide, lift front hip points, sit up tall and take deep breaths. ​Inhale fill the belly, exhale gently draw it in. Feeling a little sleepy from too much food? Try this pose. Its relaxing, especially if you use lots of props. The deep stretch in the quadriceps will keep you from falling asleep, and the opening of the front body will improve digestion and help energize you. ​Prop up! Use as many props as you need. Watching TV with friends and family? Rather than sitting (again), grab a pillow or stack some blankets and lay propped up on your belly. 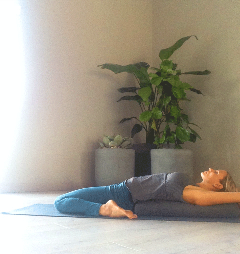 ​Another great pose for digestion and low back pain. ​Breathe deeply, and feel belly press into the floor. ​To rest, stack hands, splay elbows, turn head to one side and lower onto hands. Do both sides to release neck tension.